Welcome to GoWithBlue.com website for Suburban Property Management. Suburban Property Management was established in 1980, and has been proudly serving the State of Wisconsin for over 30 years. Our focus on quality service with superior customer satisfaction has set us apart in the industry. Suburban specializes in all property management needs from landscaping services to snow removal, and our relationships exist from commercial to residential. You've noticed Suburban's blue trucks in your area for years......isn't it time for you to GoWithBlue? 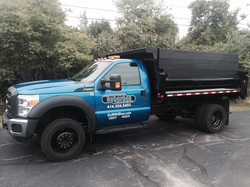 The blue trucks you've seen in your area...that's us, and we have been there for years. From our blue uniforms to our blue trucks, when your property requires superior service and dependable people, you need to GoWithBlue! Spring is well upon us and there is plenty of work to be done. Mulch, landscaping, grass cutting/trimming and more, GoWithBlue to get your jobs done early.